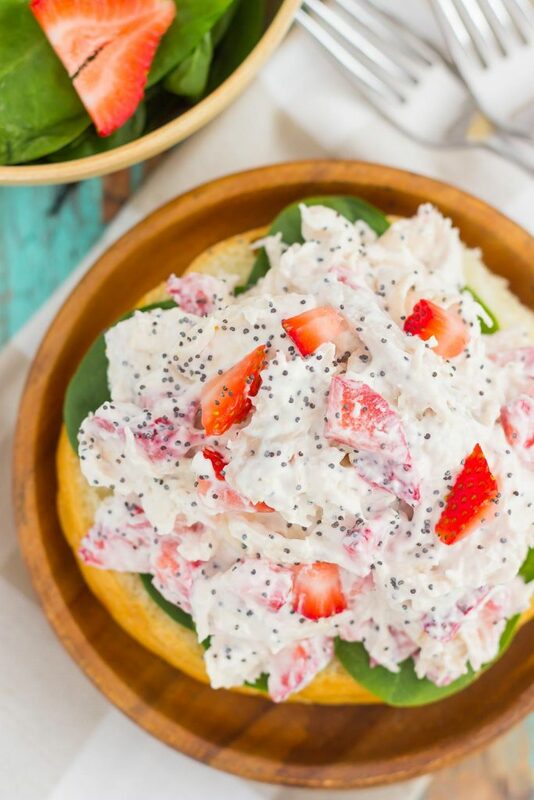 This Strawberry Poppy Seed Chicken Salad is packed with shredded chicken, a light dressing of Greek yogurt and mayo, and bursting with juicy strawberries and poppy seeds. This dish is fresh, flavorful, and filled with just the right amount of sweetness! Let’s talk about chicken salad today. What are your feelings on this versatile dish? For me, I like it, but I’m very selective about it. You may remember me mentioning my least favorite (or most hated) foods in this post from a few weeks ago. Celery is in the top three of that list, and it also happens to be a main ingredient in most chicken salads. Hence, that is the reason why I normally don’t eat chicken salad, unless I make it myself. I’m also selective because of the miracle whip found in a lot of chicken salads. I’m a huge mayo girl. Always have been, and always will be. Miracle whip? Yucko. I just can’t get over the taste, which is also why I’m not a big fan of potato salads. So, even though I love chicken salads, I hardly ever eat them. Most restaurants can’t change up the ingredients, and most people make theirs with miracle whip and celery. And that’s ok…to each his own, right? Last summer, I whipped up this Lightened Up Zesty Chicken Salad, that’s packed full of shredded chicken, corn, bacon, and garlic. It’s also on the lighter side because I used mostly plain, Greek yogurt, with just a few tablespoons of mayonnaise for that added richness. It quickly became one of my most popular summer recipes, and for good reason. Man, oh man, is it good! So, when my chicken salads cravings hit a few weeks ago, I decided to put a summery spin on the dish and make this lightened Strawberry Poppy Seed Chicken Salad. I randomly thought of the idea after consuming way too many strawberry and spinach salads lately. I didn’t even check to see if this was already a recipe idea on Pinterest or Google, I just went with it. And I’m SO glad I did. 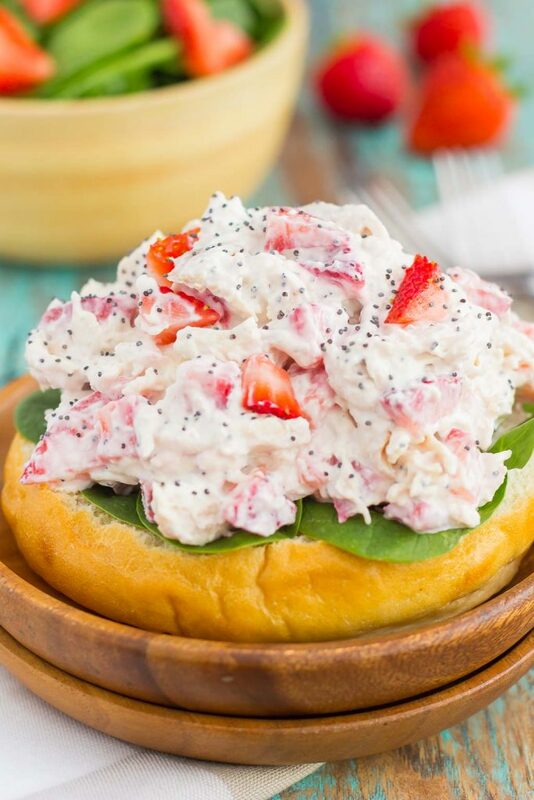 This Strawberry Poppy Seed Chicken Salad is packed with shredded chicken, a light dressing of Greek yogurt and mayo, and bursting with juicy strawberries and poppy seeds. This dish is fresh, flavorful, and filled with just the right amount of sweetness. I’ts perfect to pile onto bread, toss with a salad, or just to eat it by the spoonful! Now, you may think that strawberries and chicken salad don’t go together, but, trust me when I say that they do. They REALLY do! The flavor is incredible, to put it mildly. To start, I used a base of mostly plain, Greek yogurt and added in just a touch of mayonnaise. It makes the dressing healthier, light and not so tangy. I also used shredded, rotisserie chicken found near the deli section of my grocery store. You can also cook and chop your own chicken, or shred it yourself, but I love grabbing some already shredded, fresh chicken. Makes my job so much easier! Simply mix the dressing together, toss in the shredded chicken, fold in the strawberries and poppy seeds, and this Strawberry Poppy Seed Chicken Salad is ready to be devoured. It literally takes just 5 minutes, from start to finish. You can’t get much easier than that! One bite and you’ll be hooked on the burst of flavor that shines through from the strawberries. It pairs so well with the lightened dressing and fresh chicken. 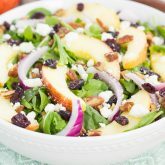 This easy, summer salad is perfect for healthy sandwich, a delicious topping to a sandwich, or just to eat it by the spoonful. But, whatever your pleasure may be, I guarantee this will be the chicken salad of the summer! 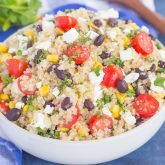 Looking for more salad recipes? I’ve got you covered! P.S. Check out my very first E-CookBook, 30+ Twenty Minute Meals: From Breakfast to Desserts and Everything in Between, designed with you in mind! In a large bowl, combine the yogurt, mayonnaise, lemon juice, salt, and pepper until smooth. Add in the chicken and toss to combine. Fold in the strawberries and poppy seeds. Serve on bread, a bun, or on top of a salad, if desired. Chicken salad will keep refrigerated for up to five days. Okay, so here I'm going to sound like a total ignoramus, but what's the difference between Miracle Whip and mayo? Is it just a lower fat version? I've never been able to discern a difference. That makes me a not great taste-tester. Either way, this is the one I'd want to eat! The spin is fantastic! Miracle whip is a lot tangier and just tastes gross to me! I don't know ingredient wise what the difference is, though. Mayo is a lot richer (and way better) at least to me! :) Thanks, Mir! Hi Lyn, if miracle whip is what you prefer, then go ahead and use it. I personally dislike it and always opt for mayo, which is why it's in this recipe. Gayle, I love chicken salad, egg salad, all of it! 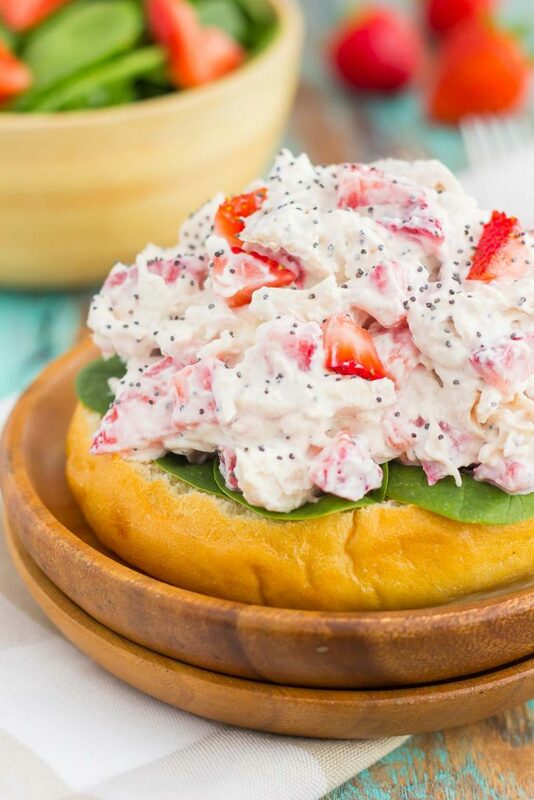 love this Strawberry Poppy Seed Chicken Salad!!!! Poppy seeds, what a great addition!!!! it looks so good! Happy Friday! Thank you, Alice! Happy Friday to you, too! Thank you, Melanie! It's such a fun twist on the regular kind! Well, this has got to be the prettiest chicken salad I've ever seen! And I am absolutely loving the flavors!! 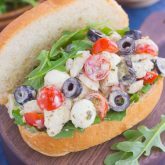 I am a fan of 'any' chicken salad (except for those made with Miracle Whip) so this will definitely be one I make this summer! Thank you! I love how you kept it lighter with the Greek yogurt, but still get the taste of the mayo in there. Miracle Whip is YUCK, I agree! And I always love to add a bit of sweetness to my chicken salad with fruit, so this is right up my alley. I want to make it this weekend! Thanks for the chicken salad love, Dawn! Oooh never saw chicken salad with strawberries!! I like this idea and MIRACLE WHIP -gross yes yes!! I hate that stuff and so glad you made this without miracle whip!! Happy weekend friend!! Thanks for the kind words, Ami! Happy weekend to you, too! I guess the celery would deter you from chicken salad...haha I actually love the celery but hate the gloppy mayo. I love this version with mostly Greek yogurt, and the fruity spin with the poppy seeds was such a great idea! 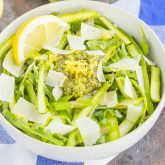 This looks like a delicious version that's just perfect for spring and summer! Love chicken salad and strawberries, too! This is such a cool idea! (I never use celery :) ) ! Pinning to try it! This has got to be not only one of the prettiest chicken salads I've ever seen but one of the best combo purposes for strawberries! Really loving this recipe Gayle, so great for summer! Oh this looks super delicious!!!! I love adding red grapes to my chicken salad but I've never tried strawberries! I'll have to give it a try! Thanks for the kind words and for stopping by, Alaina! The salad looks gorgeous Gayle, what wonderful combination! Intriguing summer variation on chicken salad! Sounds delicious. It is SO good and perfect for the summer! 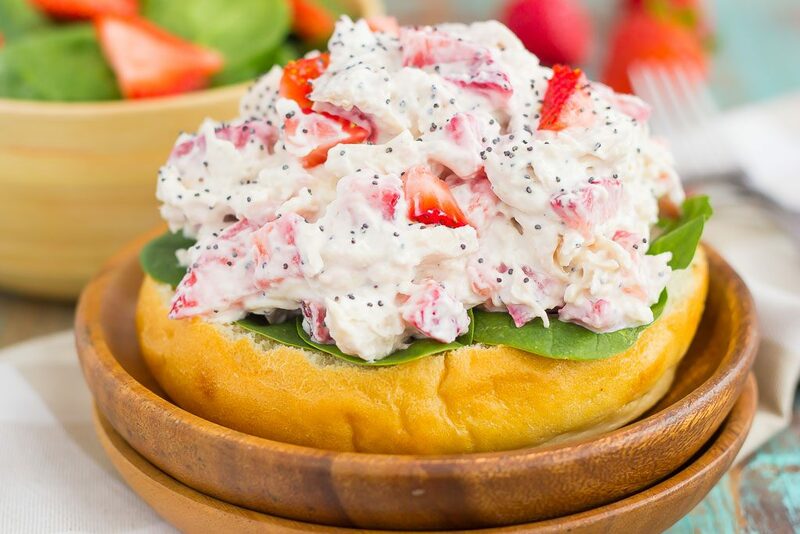 I am hugely selective about chicken salad (for me it all depends on the amount of mayo - I'm good with the celery) - but this strawberry version is a must-try! It's been a while since I've had chicken salad but I'm absolutely loving your lightened up version. The strawberries and poppyseed are such a creative twist! So perfect for summer! Thanks for the chicken salad love, friend!